In spite of the harsh (for us anyway) winter temperatures of the last month, I’ve managed to rally and get some things done in the garden ahead of the season. Much in the way of cleanup, a load of beautiful compost (about 60% of it remains in the truck bed as I type), lots of planning and head scratching. Besides the usual off-season tasks, there is generally a short list of more complex and likely procrastinated projects that I need to address. Well, I’m happy to report that I can now cross a really big chore off of this part of the winter to-do list: The leveling of “the bell”. 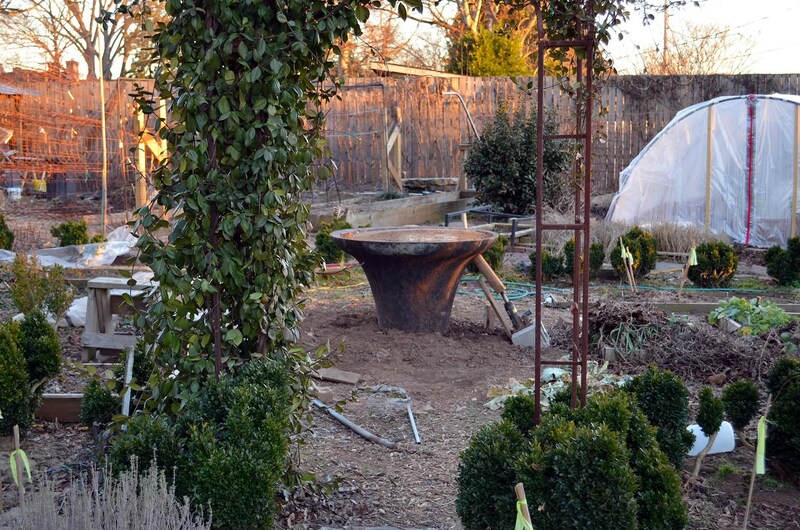 You may have noticed in a post or two over the years that I have an odd birdbath in the middle of the boxwood flanked section of the garden. 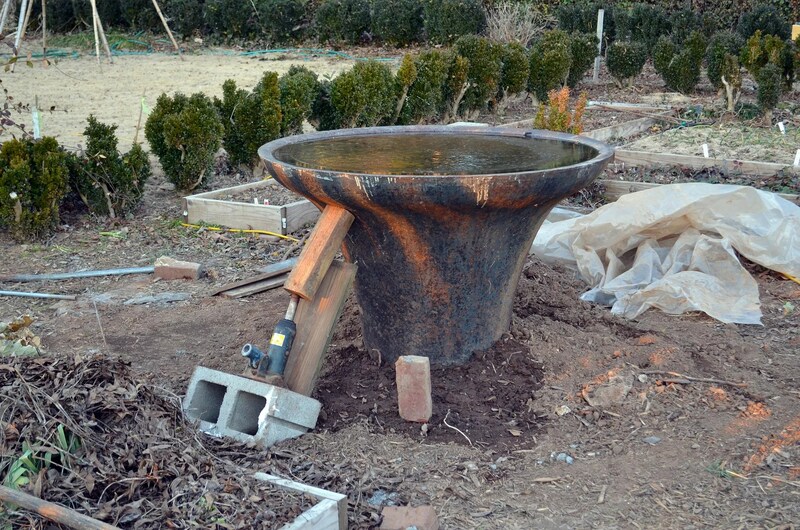 It is a bell, a rather large iron one, inverted on a tired foundation and usually completely full of water. This bell was moved here sometime after 1932 and had at one point hung in a tower on a hill downtown, serving as the fire/call bell for the volunteer fire department from the late 1800s presumably up until electricity provided the juice for less cumbersome means of notification. So a while back I started digging an “investigative” hole. Eventually I had excavated a bomb crater around the bell, exposing the “foundation” that it rested upon. I needed to actually dig our underneath the foundation on both the high and low sides so that it could be tipped a little (somehow) and then new concrete underpinnings could be worked underneath. This past weekend I decided that it was time, then retrieved a bottle jack, a concrete block and some sections of landscape timber. Oh yeah, and 720 lbs of concrete to be mixed by hand…. I admit that I was surprised how easily this 3000 lb hunk of iron righted for me. How do you know how much it weighs? Geometry from 9th grade and weight per cubic inch of iron (.26 lbs) Conservative estimate gave 3397 lbs and I rounded down to 3000. I really think it is much more though. So not completely pulled from dark spaces…… ;). hmmmmm. You sure those aren’t rust stripes?